Material:Made from 100% natural latex,environmental and non-toxic,with high elasticity,durable,has good air permeation and antibacterial function. This mask is made from 100% natural latex.Latex material have no impurities,with high elasticity,the better workmanship,very soft and comfortable. Material:made from 100% natural latex. Size:children and adult size. Occasions:Christmas,Easter,carnivals,costume parties,tag parties,nightclubs and many more. We have a variety of animal masks,Horror mask and artificial masks.With our realistic mask,where to go is all the focus of conversation! If you are allergic to latex,don’t wear this mask. Any question please kindly to contact us and we promise to work hard to help you to solve the problem. 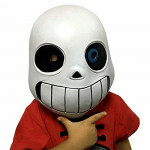 Conversation Focus:Look at its eyes and expression,everyone will love this funny mask!In the evening,this mask’s eyes have a luminous effect.What colour do you like?We support Change color.It’s the perfect addition to your funny cosplay party costume.